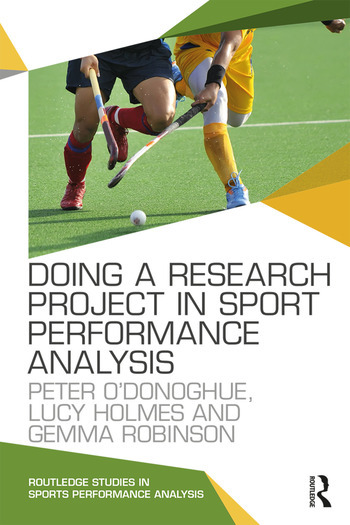 The research project or dissertation is a core component of any degree programme in the rapidly developing discipline of sport performance analysis. This highly practical and accessible book provides a complete step-by-step guide to doing a research project. Showcasing the very latest research methods, it covers the whole research process, from identifying a research question and system development to data collection, data analysis and writing up the results. collecting, interpreting and presenting results. Doing a Research Project in Sport Performance Analysis is an indispensable guide for any student, lecturer or practitioner working in sport performance analysis. Peter O'Donoghue is a Reader in Sports Performance Analysis in the School of Sport at Cardiff Metropolitan University, UK. He is also the Programme Director of the BSc Hons Sports Performance Analysis degree. He has worked as a performance analyst in Gaelic football (inter-county level) and netball (junior and senior international levels as well as in the National Super League). Peter is a member of the International Society of Performance Analysis of Sport and General Editor of the International Journal of Performance Analysis in Sport?. Lucy Holmes is a Senior Lecturer in Sports Performance Analysis in the School of Sport at Cardiff Metropolitan University, UK. She is currently Programme Director for the MSc Sport Performance Analysis and MSc Professional Practice degrees. Her research interests include the use of technology in sport and education, the use of performance analysis and technology to provide feedback to athletes, and the use of performance analysis in assisting the development of sport-specific fitness assessments and training programmes. Lucy teaches courses on performance analysis and dance and also works as Lead Performance Analyst for Hockey Wales. Gemma Robinson is a Senior Lecturer in Performance Analysis in the School of Sport at Cardiff Metropolitan University, UK. Her research interests include time-motion analysis, the assessment of injury risk and the analysis of technique. She teaches courses on performance analysis and research methods at both the undergraduate and postgraduate level.